Protects hot dogs from debris and people!! The Roller Grill Guard are heat resistant and exceptional durability. For an added convenience, customers can rest buns on top to make the hot dog. The guard fits firmly on top and easily removed for cleaning. 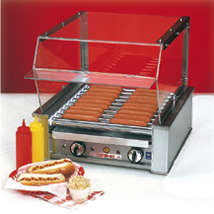 The 10 hot dog guard measures - 16 3/8 in. x 10 1/4 in. x 7 in. The 18 hot dog guard measures - 19 in. x 17 1/2 in. x 8 3/4 in.